My daughter has just graduated 4 years of College. She received a Bachelors degree in Psychology and a Minor in English. She is the first on my side of the family to ever graduate college and we are so proud of her. It has definatly been an experience for us all. She worked hard to get where shes at. She was a straight A student in High school and even though she didn't have a perfect score all the time in College. She did manage to be on the Deans and Chancellors list a couple times. I have been ready and prepared for this day but no one told me it would be such an emotional time. Really, Its like for the last couple weeks, all I can think about is her first day of school, what teachers have told me through the years, all the crazy phases she went through, Her best friends that came and went, all the homework, the sports, the awards, just everything and now its seem to just all come to an end and it makes happy/sad, Im excited and scared at the same time of what her future holds. We know the struggles she will now have to face. We hope and pray college pays off and she can be successful. Save hundreds of dollars by buying books from EBay or Amazon. Sororities can be expensive but also worth the experience. My daughter is a Kappa Delta. Umbrellas miraculously just disappear. keep a few on hand. Printers may become tables and a place to stash candy and other snacks. Breaking a toothpick off in the door lock because you locked yourself out, is considered vandalism and cost you alot of money. Keep extra chargers and cords available. They just break for no reason. Laptops just fall off the bed and break at some point. All by themselves. Save for the extra one you will have to purchase. Bobby pins, paper clips and staples will tear a printer up so save money to buy another one of those too. and wall mirrors, flip flops and shower caddies are a must. Check back next weekend as I share details of her party! Congratulations, Ashley!!! The Wilcox Family are so proud of you! love and hugs! What an exciting time for you, your daughter, and your family. My son just finished his second year at college and I'm already crying. My youngest is in kindergarten and I've made him promise me he will never grow up and always be my special little boy. I doubt he will listen any more than the others. Drat! It is so exciting to watch them grow up, but each step is a change in our lives as well. I pray your daughter finds much success. Congratulations, Ashley! I hope she get everything that she hopes for in the future! How exciting!!! 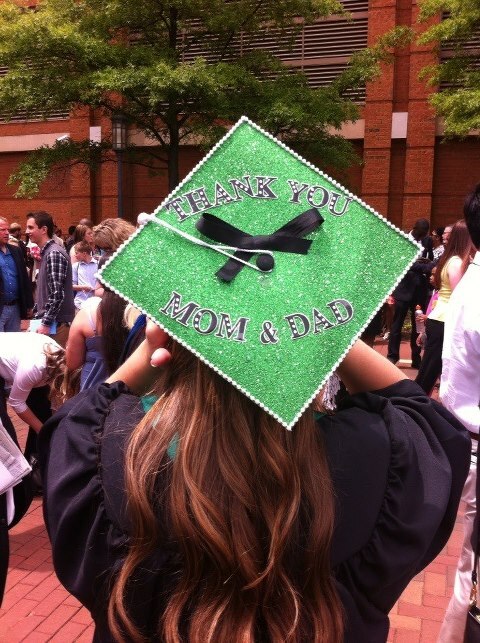 I'll be in your shoes next year with my only child/daughter graduating college also.